An 11-year-old boy who died after falling 200ft (60m) while on a family walk on Snowdon has been named. Liam Costello, from Merseyside, was in a walking party with his father and another family when he fell down the Crib Goch part of the mountain. Liam suffered extensive head injuries and was pronounced dead at Gwynedd Hospital in Bangor on Friday. His family said Liam was a talented sportsman who had played both football and cricket for the city of Liverpool. He had been selected for trials for Lancashire Cricket Club as a leg spinner, his family added in a tribute. 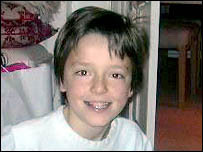 They said Liam was "adored by his mum Patty and dad Liam, also worshipped by his little brother Tom. He touched the hearts of everyone he met". Bad weather and poor visibility had made it difficult for the helicopter to reach him on the mountain on Friday. Thirty members of Llanberis Mountain Rescue Team and a group from RAF Valley at Anglesey attended the scene. Mountain rescue chairman Gwyn Roberts said that low cloud had delayed the operation to airlift the youngster.